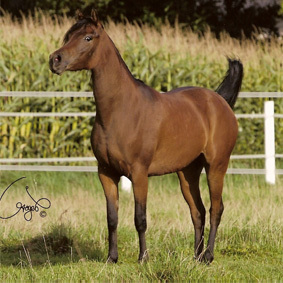 Azabat-Arabians is a leading small breeder of finest straight egyptian Arabian horses since 2014. 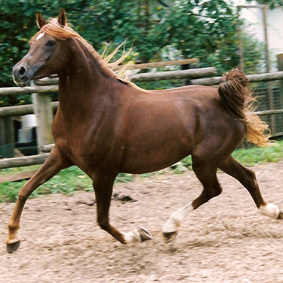 The years before we bred purebred arabian horses with 60% russian blood, but with the death of our foundation stallion Waskan we stopped our breeding program and started in 2014 with breeding of straight egyptian arabians. 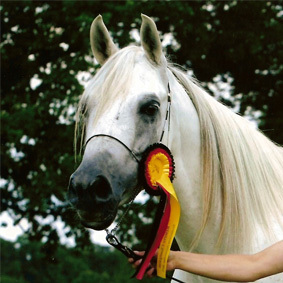 WE ARE SAD TO REPORT THAT OUR WONDERFUL WASKAN DIED IN JANURAY 2008. HE LEAVES BEHIND A LEGACY AND MANY HAPPY MEMORIES. IT HAS BEEN OUR PRIVILEGE TO HAVE SPENT ALMOST 17 YEARS WITH HIM AND HE WILL BE SORELY MISSED. Waskan was not only a performance stallion, but also impressed by his correctness, excellent topline, strong nerves, extreme Arab charisma and stunning movements! "In heaven we will see you again, until then do it well, you faithful friend!"